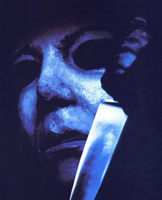 Movie Description: Six years ago, Michael Myers terrorized the town of Haddonfield, Illinois. He and his niece, Jamie Lloyd, have disappeared. Jamie was kidnapped by a bunch of evil druids who protect Michael Myers. And now, six years later, Jamie has escaped after giving birth to Michael's child. She runs to Haddonfield to get Dr. Loomis to help her again. Meanwhile, the family that adopted Laurie Strode is living in the Myers house and are being stalked by Myers. It's the curse of Thorn that Michael is possessed by that makes him kill his family. And it's up to Tommy Doyle, the boy from Halloween, and Dr. Loomis, to stop them all. -This is the COMPLETE SET of movies for HALLOWEEN 6. You are going to get all 4 versions of this film - Unreleased, Uncut in one amazing package. BE PREPARED FOR THE ULTIMATE EDITION OF "THE PRODUCER'S CUT" IN IT'S HIGHEST QUALITY EVER AVALIBLE! WITH SO MANY EXTRAS IT TOOK FIVE DISC'S! 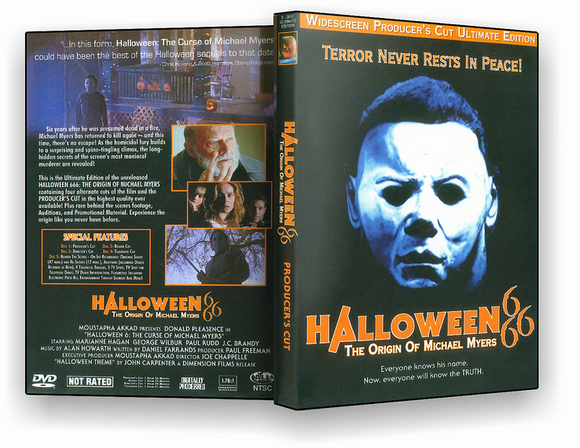 Uncut 16X9 Anamorphic Widescreen a completely different version of H6: The Curse Of Michael Myers over 40 mins alternate footage in 4 versions. -Comes with artwork shown in a standard sized DVD case. All Movie Discs are High Quality DVD-R, Region Free, NTSC Format.